Tu Bi-Shvat is here! It is the “new year for trees” in Judaism, which here at Fruits and Votes we take as a pretty special occasion. The full moon of the month of Shvat marks one of those seasonal turning points–winter is coming to end (for those of us in northern-hemisphere Mediterranean climates, at least), and the fruit trees will be blooming before long. Traditionally, this observance is said to mark the time when the almond trees begin to bloom in the Land of Israel. Here, where our climate is broadly similar, it is coming a bit too early this year. It makes me think we just might need a second month of Adar, following the first month of Adar that will start with the next new moon in about two weeks. In fact, by the lunisolar calendar used in Judaism, we will indeed have two Adars this year, as otherwise we would be putting ourselves on a path to celebrating Pesach (Passover) too early. It needs to be at the full moon of the first lunar month after the vernal equinox. With the winter solstice only about four weeks behind us, it is indeed a bit early in solar-season terms for the almond trees to be blooming. Here is mine now, for instance. The buds have been swelling for a while, but it’s not ready to bloom just yet. By comparison, last year buds began swelling around the 9th of January, but the first blooms did not open till the 30th–conveniently, the eve of Tu Bishvat, so right on time! In 2017 it also began its bloom on the eve of Tu Bishvat, even though that happened to be the 10th of February! The range of late January/early February is about right for first almond blooms, and is also generally when Tu Bishvat, but as I elaborate a bit below, the Jewish calendar by no means guarantees that Tu Bishvat will line up with any specific point in the season, but it will always be one of the first two full moons following the winter solstice. Notwithstanding the date on the Jewish calendar, then, it seems the almond will be a little early, relative to Gregorian calendar dates of past years. 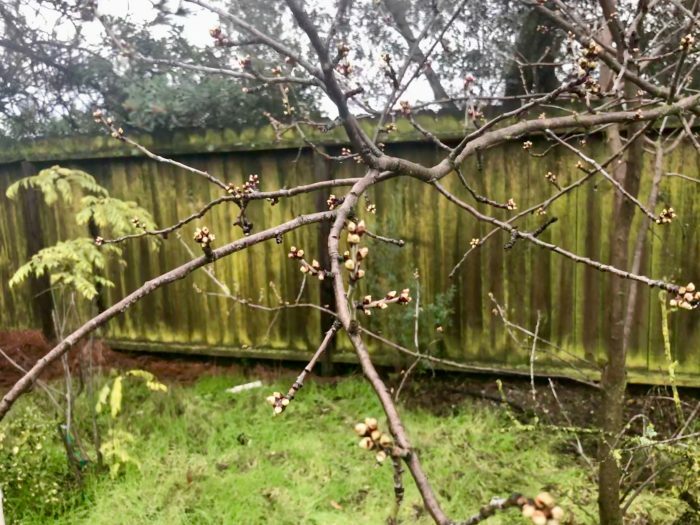 And that may be a harbinger of early blooms on many of our fruit trees, something I have expected ever since the surprising bout of chill very early in the season, occasioned in part by the heavy smoke. At least the varieties that are relatively low chill should have had their requirement met by now; given that January has been quite warm, the higher-chill fruits may still be waiting around longer for further chill (which we may not get; outlook is for unseasonably warm weather, which alas, is becoming the new normal). 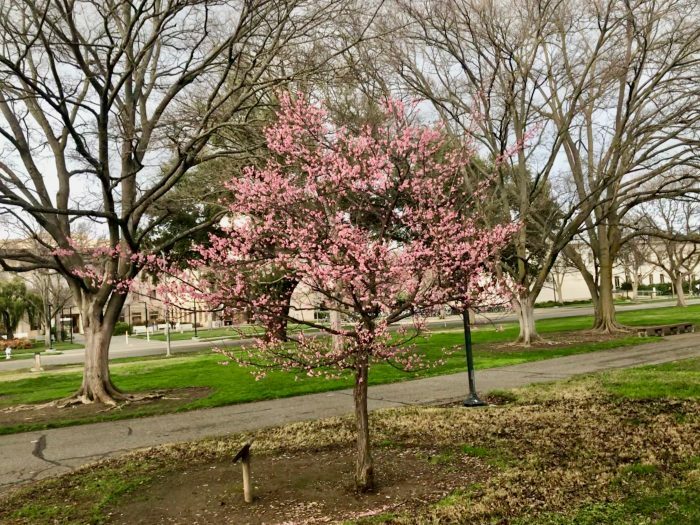 This is an ume apricot in the UC Davis campus, obviously already in full bloom, as of late last week. The ume is traditionally associated with new year in Japan, which on the Chinese version of the lunisolar calendar will be at the next new moon (the one that on the Jewish calendar will be I Adar this year). Chinese years start on the first or second new moon after the winter solstice; the next new moon will be the second. While this year’s New Year for Trees may be a bit early, the timing is nonetheless fortuitous in another sense. It coincides with a lunar eclipse. In fact, with a “super blood wolf moon.” The Tu Bi-Shvat seder includes three different kinds of fruits, where the categories are: (1) inedible exterior, edible interior; (2) edible exterior, inedible interior; (3) entirely edible. To mark the occasion of the “blood” moon, our fruit for the first category will be blood oranges, which happen to be in season now. Let’s all enjoy some good fruit and fruit-tree blooms as spring approaches! * Various ume festivals start in early February and run until some time in March. This entry was posted in FRUITS, Judaism, Sun & Moon. Bookmark the permalink. In Toronto, Canada, is the The Jewish Indigenous Tu BiShvat Seder, on Sunday, Jan. 20th at Holy Blossom Temple, facilitated by Kim Wheatley, an Anishinaabe Traditional Teacher, and Rabbi Denise Handlarski and Rabbi Miriam Margles, with interactive nature activities led by Shoresh. This will be the fourth year of the seder, which is an evening of sharing Jewish and Indigenous nature traditions where we use the Jewish holiday as a platform for sharing cultural traditions through songs, poetry, reflections, and traditional food rituals. I am going to mention the celebration of Matariki this year.